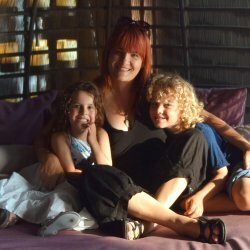 The true test of whether a holiday resort is kid friendly is to ask a kid. 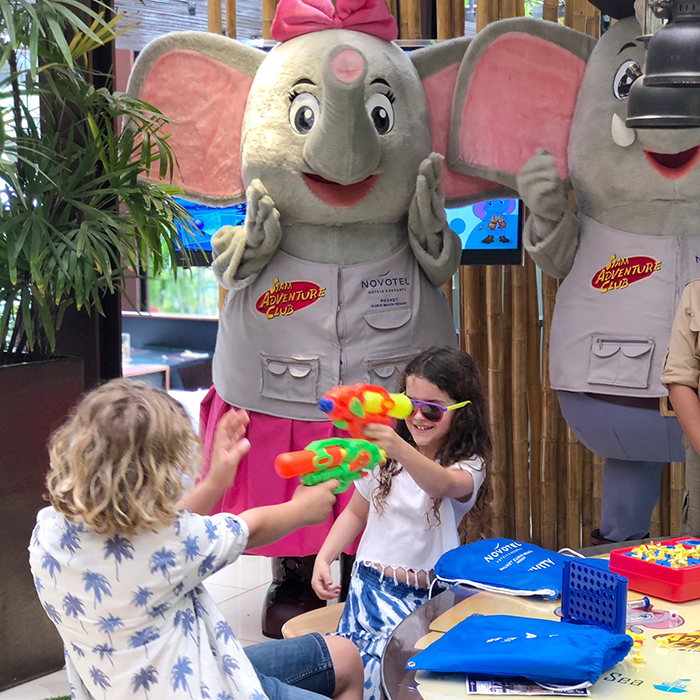 Here, our very own ten-year old junior correspondent and international man of mystery, Raffles, is sharing his thoughts on why Novotel Phuket Surin Beach Resort is cool for kids. 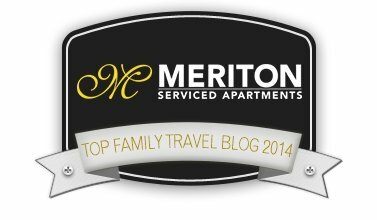 From the second we arrived from the airport, the welcome at Novotel Phuket Surin Beach Resort was off the charts. They seriously treat kids like rock stars at this place, just the way we like it! Along with a yummy welcome drink they even handed us a backpack filled to the brim with goodies, including sunglasses and water pistols. Not only were the staff super nice, but so was awesome Elfie (more on him in a minute). 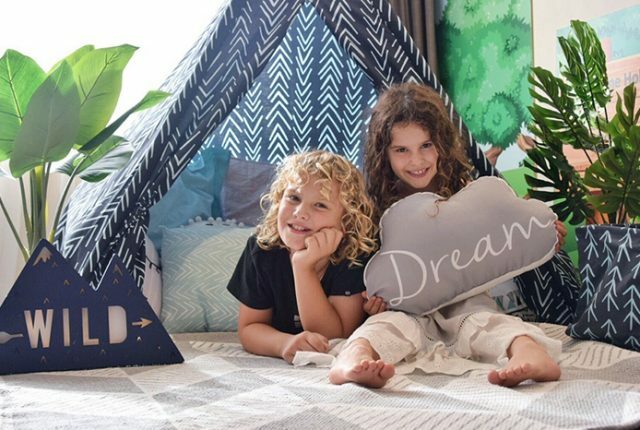 Our family room was packed with special welcome treats like hand-made chocolates, fresh drinking coconuts, big cuddly bears for my sister and a family of towel elephants with a huge welcome written in tropical flowers and leaves spread across mum’s bed. At least my mum and sister told me, I was too distracted by the in-room PlayStation in my room to notice. Booyah! Ok, so who is Elfie? He and his girlfriend are the hotel’s super friendly mascots. 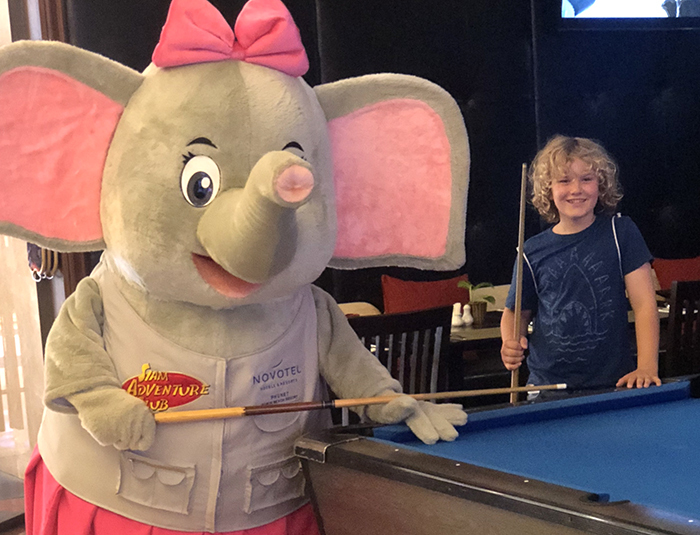 While my little sister couldn’t get enough of cuddling them, I preferred to get down with the dancing duo and let me tell you, those two are SHARKS on the pool table. But what I liked most about them is that these are two elephants you can interact with in Thailand where there’s no cruelty involved. That really rocks. Elfie is part of the hotel’s new Siam Adventure Club, hosted by a squad of rangers who have to be the nicest and funnest people in the whole of Phuket. It’s an awesome program for kids that includes all kinds of awesome activities like umbrella painting and origami, movies and pool games. 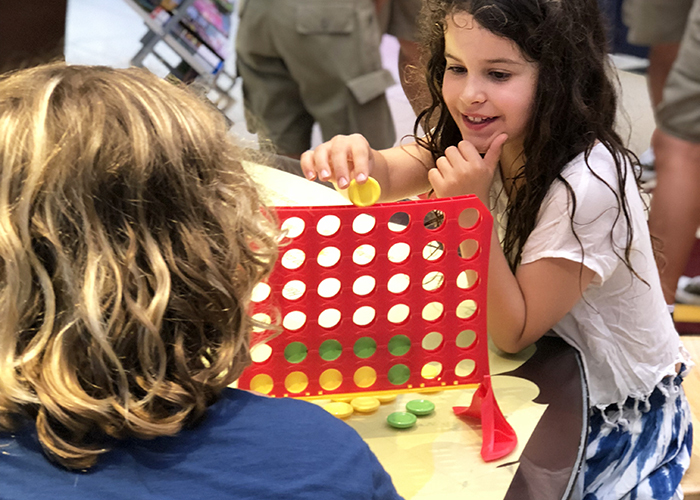 Plus, there are a stack of cool board games like Connect Four, Guess Who and Jenga at the Siam Adventure Club Tour Desk, where anyone crazy enough to want to actually leave this awesome place can organise tours of the island. 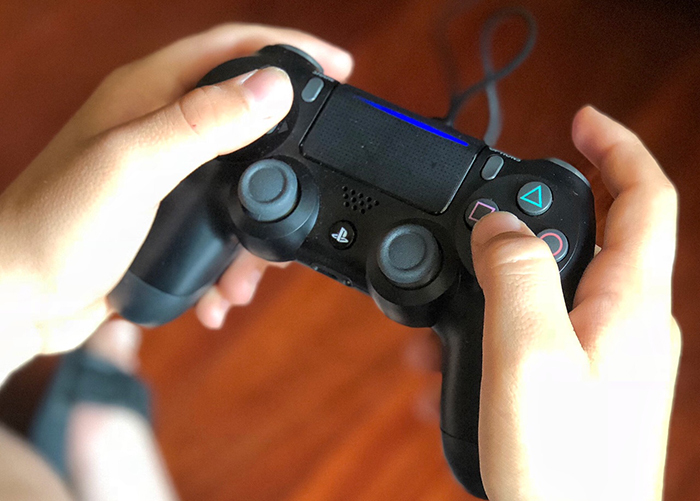 To be completely honest, I’m not usually a big fan of kids’ clubs because the activities always seem to be aimed at little kids, and I actually like hanging out with my parents, because they’re pretty cool. 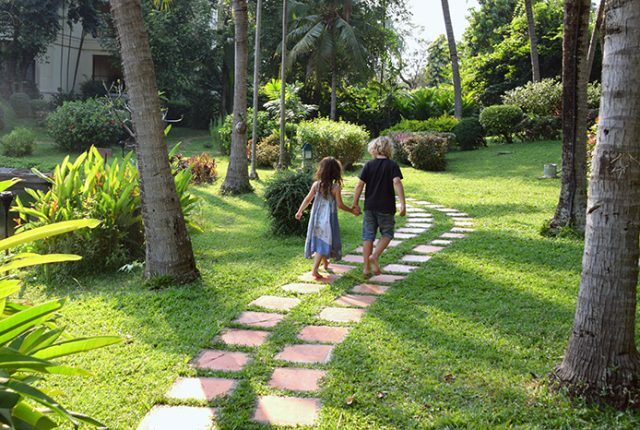 But the two-storey Kids World Kids club at Novotel Phuket Surin Beach was great. There were indoor and outdoor games plus activities like Thai dancing and crafts. There’s also playground with climbing structures, slide and ball pit for younger kids. And when I saw they had a PlayStation 4 room, complete with bean bags, I couldn’t get my mum to the spa fast enough. My sister and I have been doing Jujitsu for ages and ages, but Muay Thai Boxing is new to us. The resort’s instructor took us through our paces, teaching us how to punch with crosses, jabs and hooks, plus turning kicks. He said I was a legend at it! Unfortunately, so was my sister so I reckon I’ll have to sleep with one eye open. 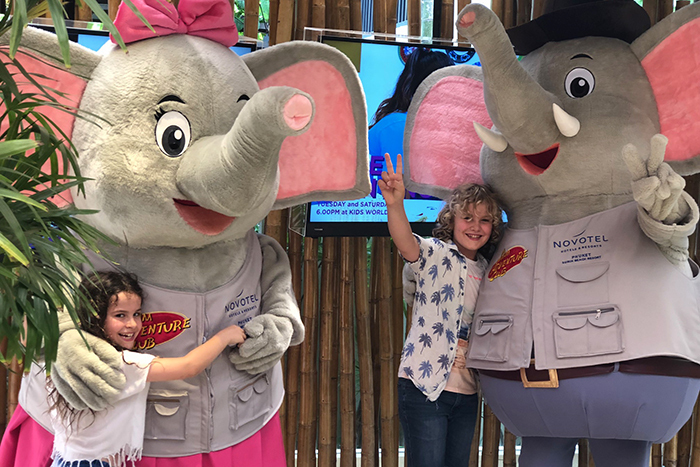 Novotel Phuket Surin also has a brand new and mega comfy cinema where we could catch some of our favourite family flicks throughout the day and evening. 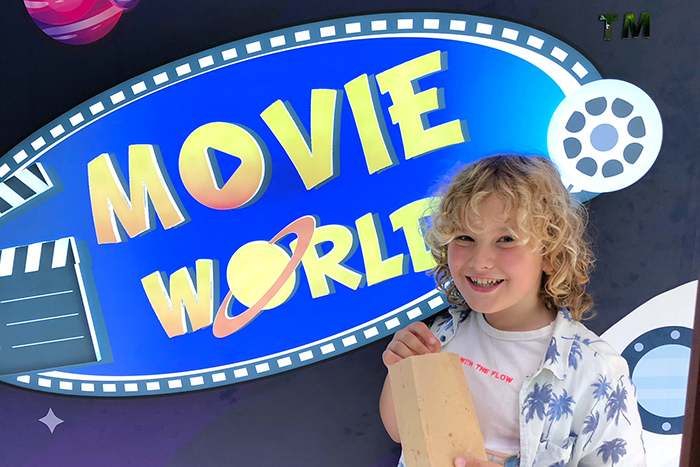 The air-conditioned cinema had loads of bean bags and soft lounges, and freshly popped popcorn that made it feel like the real deal. 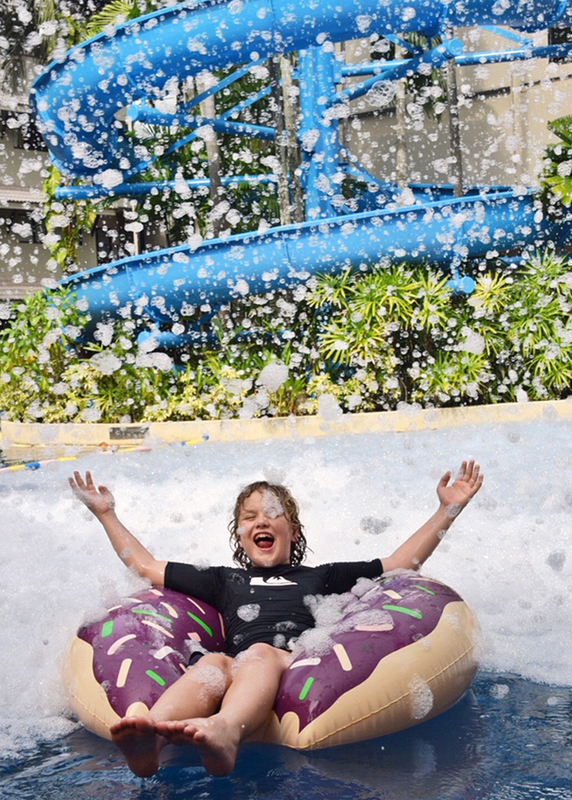 So you have to know that the huge lagoon pool at Novotel Phuket Surin Beach Resort is cool for kids. 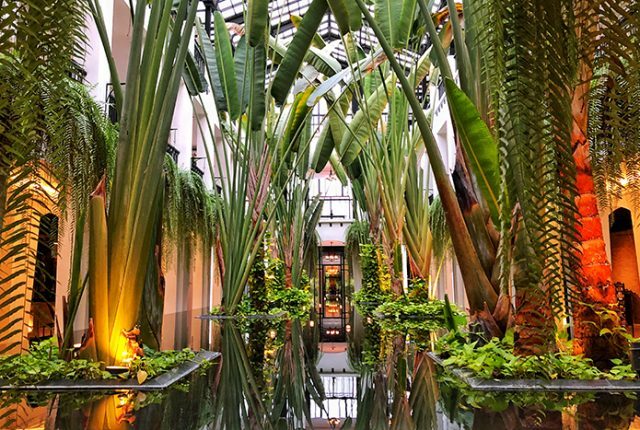 It heads in a zillion directions around little island and under bridges so you can always find a quiet corner, and it’s packed full of giant donuts and wild flamingos. OK, they’re not actually wild, they’re inflatable, but that’s even more fun. 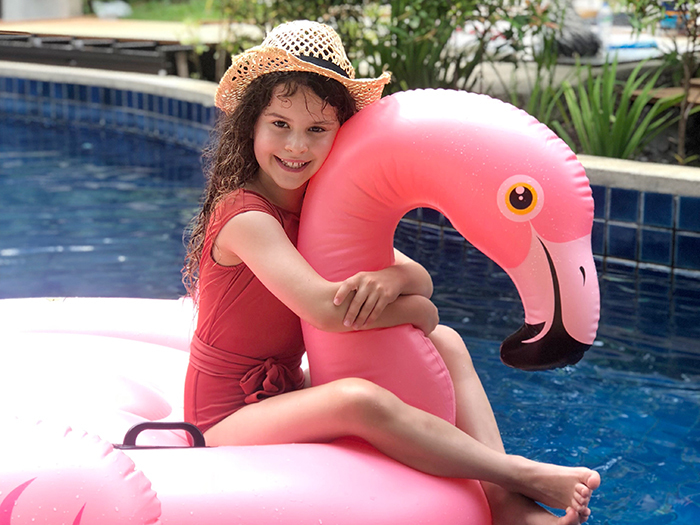 I mean, have you ever tried riding an actual flamingo? The pool has two utterly awesome slides that my sister and I rode at least six million times a day. The ranger also organises insane pool activities like pool Olympics, overwater Muay Thai boxing and inflatable zorb water walking balls which I am totally awesome at (not really). They also host a super fun weekly foam party with so much foam in the pool it feels like you’re in the world’s biggest bubble bath. Best of all the pool is open until late, so even after dark you can splash and soak and play, there are even glow in the dark beach balls to make it even more fun. 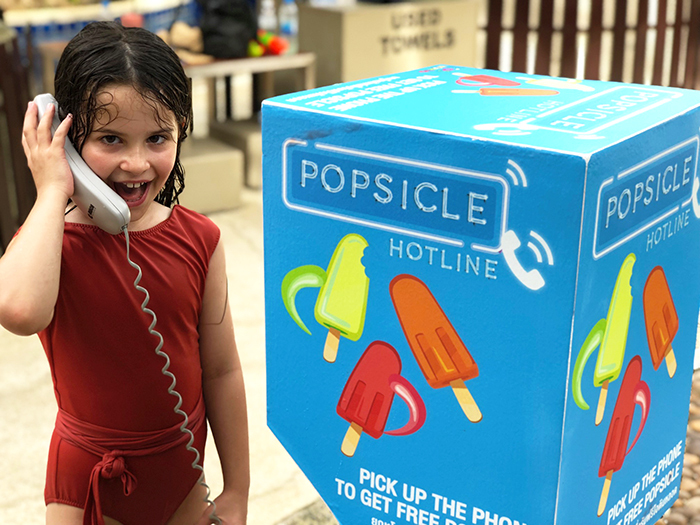 Seriously there’s a special phone booth by the pool for kids to dial up a free popsicle, anytime of the day they like. I reckon the genius who thought of this should get a Nobel peace prize or something. 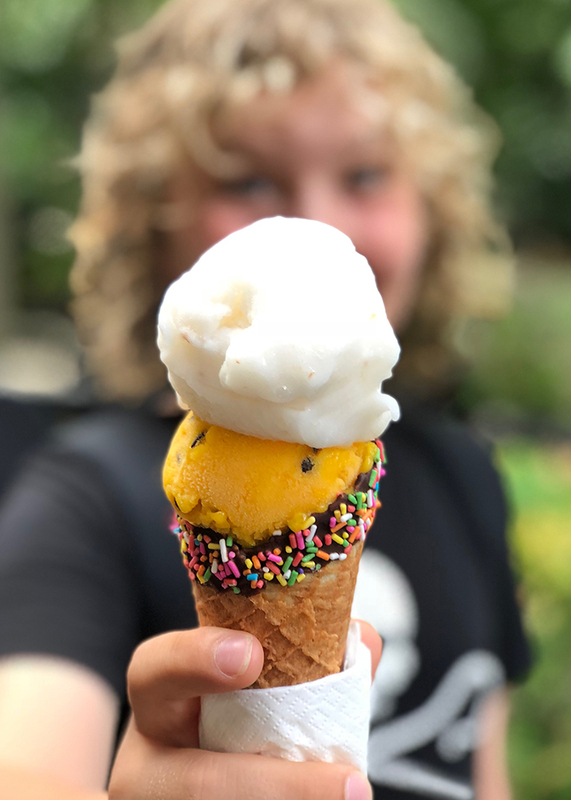 Speaking of icy treats, which are a must when it gets as steamy as it does in Phuket, the resort has an in-house ice-cream shop called Wow Cow that opened like two days before we arrived. They must have known I was coming. They have all the usual kid favourites like strawberry and chocolate as well as yummy local flavours like lychee, mango and sweet potato. But their secret weapon is to fill the bottom of their cones with whatever treats you like. I went for Smarties and my sister packed hers full of gummy bears. Yummo! 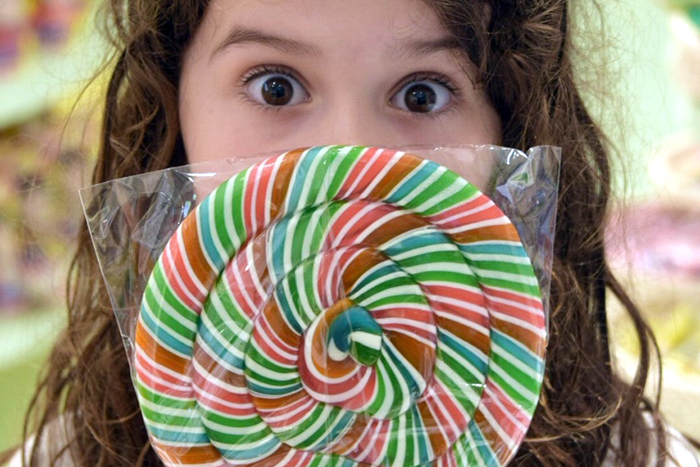 Who ever heard of an in-house candy shop at a hotel? Me. There’s a brand spanking new toy and candy store that opened while we were there. Talk about timing. 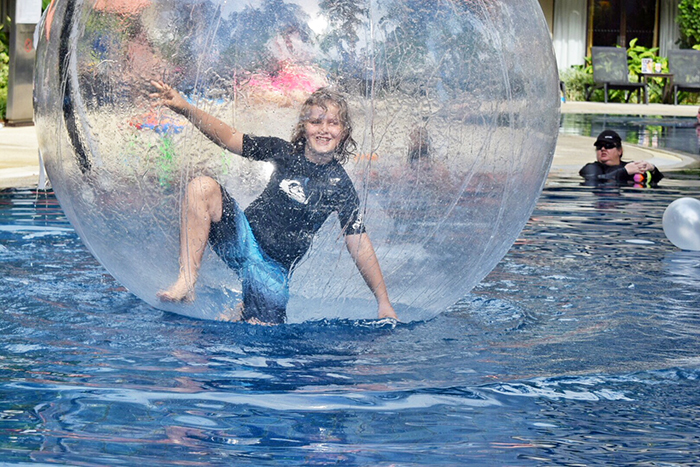 It has a giant gumball machine that was so big I could have used the globe for zorbing on the pool. And there were stacks of toys and shelves FULL of every kind of lolly and chocolate imaginable from head-size lolly pops to fizzy Asian sweets. 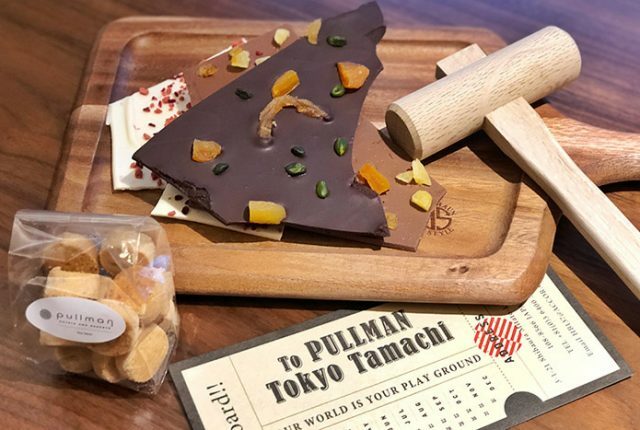 I mean, there was stuff I’d never even heard of, but I was fully prepared to eat my way through all of it, just to give it a try. Ok, so this me here so of course I have to talk about the food. Because bad hotel food is a deal breaker for me. So, I am happy to say that the food at Novotel Surin Beach is amazing form morning until night. The breakfast buffet is pretty good, with all the usual western dishes, mega platters of tropical fruit and some local dishes too. 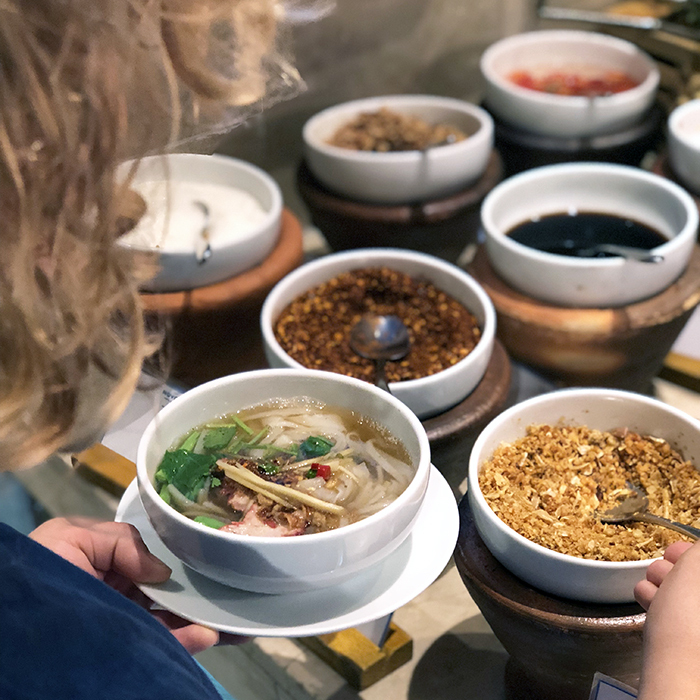 I couldn’t get enough of the soup station, where big steaming bowls of broth were cooked fresh with your choice of noodles, meat and vegetables, and there were like a thousand condiments to pile in. At lunch we ate poolside at Joe Kools. A Thai Green Curry was delish but so were the wood-fired pizzas. Yeah, I know that’s not very Thai, but these pizzas were so good, I couldn’t resist. Dinner at Asia Alive though was my favourite. 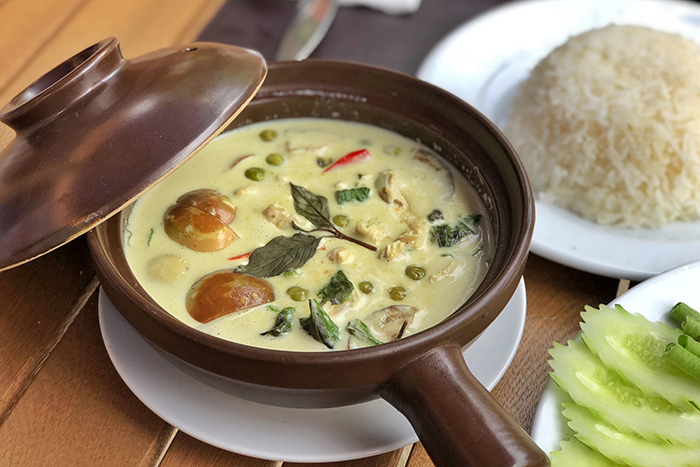 This place rocked my tastebuds with creamy red duck curry, a dreamy whole Thai-style spicy fish, and my new favourite dessert, mango sticky rice. 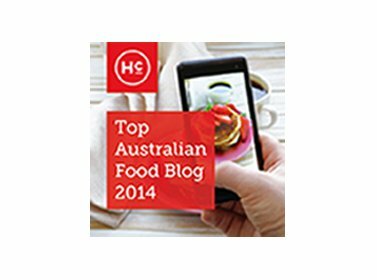 I wonder if they do deliveries… to Australia? 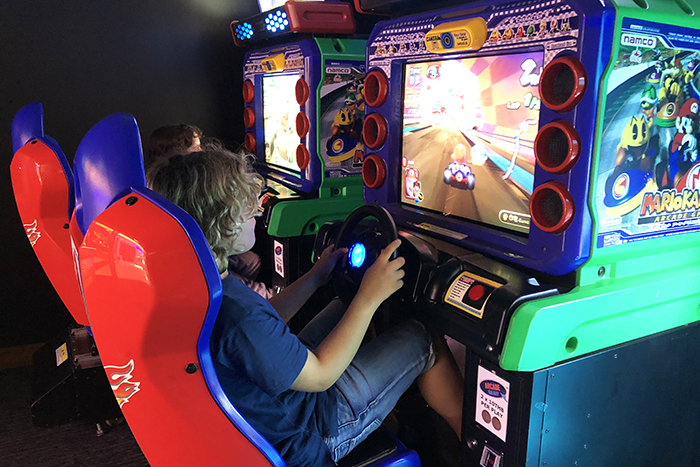 I love video games and even though we had a PlayStation 4 in our actual room, and there was a PS4 room in the kids club, we were also able to go retro at the in-house arcade where they had Mario Kart, Pacman and other cool video games. Once we’d totally nailed Mario Kart, there was also a mega ping pong table and a pool table, which one of the elephants played with us. Yes, really! If you can tear yourself away from all the Novotel Phuket Surin fun, there’s the most awesome beach right across the road. 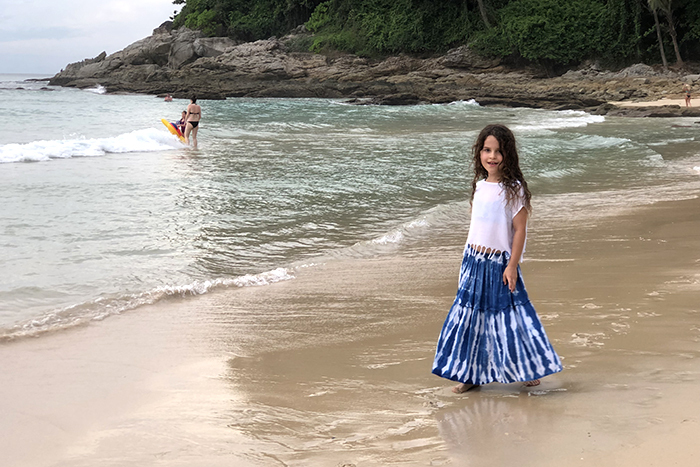 Surin Beach has to be one of Phuket’s prettiest and my sister and I loved playing in the white sand and splashing about in the waves. The waves can be a little rough at times but there are lifeguards on patrol, so kids like us need to stick to the area where they can watch you. Make sure you remind your mum and dad to bring a few dollars too because there are fresh drinking coconuts and the best ever banana pancakes available at little beach stalls. 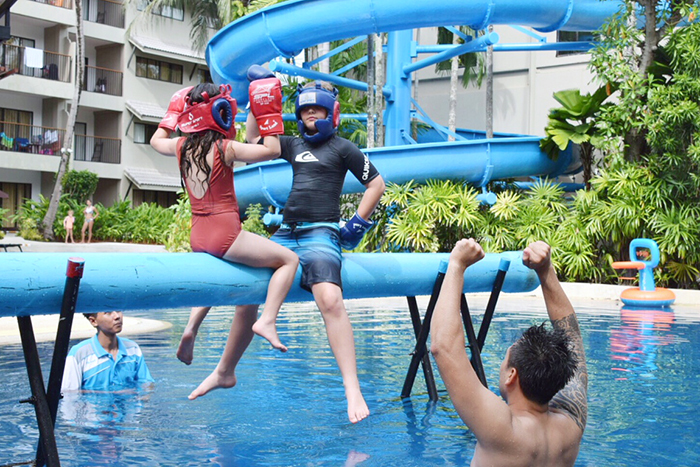 Disclosure: While we were guests of Novotel Phuket Surin Beach Resort all foam partying, candy eating, and kick boxing and opinions are Raffles’ own.